Created in 1923, Bay City State Park was the most popular state park in the 1930s when it attracted more than 1.5 million visitors annually. But due to the shallowness of Saginaw Bay, a growth of algae and organic material turned the park's pristine, white sandy beach back into the shoreline wetlands that they were naturally meant to be and attendance plummeted. In the early 1990s, the park received much needed attention with a major renovation. The size was increased from 196 acres to more than 2,200 when adjoining Tobico Marsh was added. The Saginaw Bay Visitor Center was built, the campground improved and, most important, a new beach and swimming was created. Created in 1923, Bay City State Park was the most popular state park in the 1930s when it attracted more than 1.5 million visitors annually. But due to the shallowness of Saginaw Bay and an overload of nutrients from farmland runoff, a growth of algae and organic material turned the park's pristine, white sandy beach back into the shoreline wetlands that they were naturally meant to be and attendance plummeted. In the early 1990s, the park received much needed attention with a major renovation. The size was increased from 196 acres to more than 2,200 when adjoining Tobico Marsh was added. 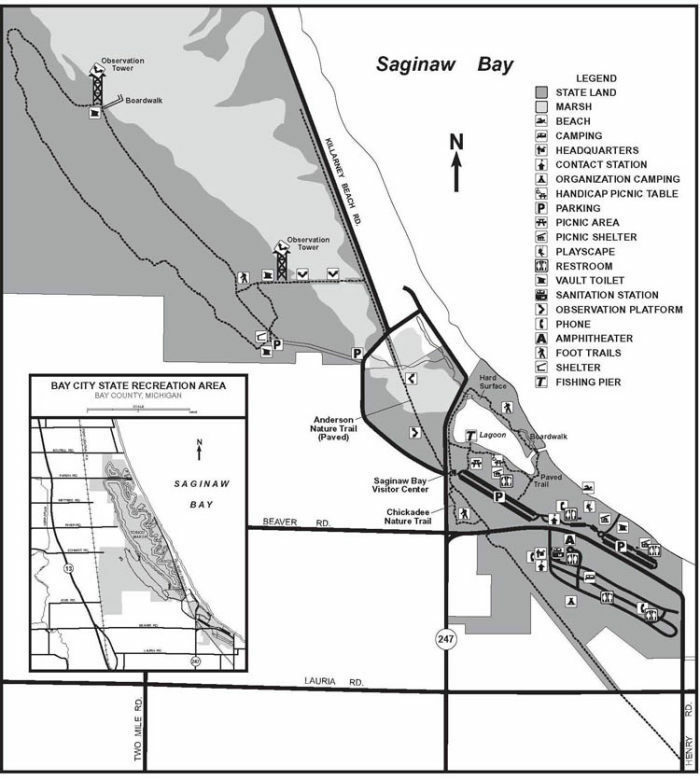 The Saginaw Bay Visitor Center was added, the campground improved and, most important, a new beach and swimming area was built at north end of the park. Today Bay City State Park is home to Tobico Marsh, the largest remaining coastal wetlands on the Great Lakes, a mile of Saginaw Bay shoreline and tracts of wetland woods, wet meadows, cattail marshlands and oak savannah prairies make it an ideal staging area for migratory birds. 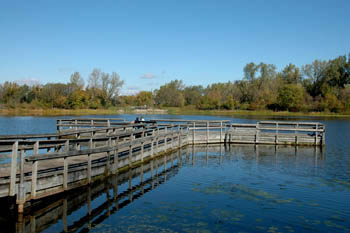 The park has long been known for its outstanding variety of bird life and as a haven for wetland wildlife and plants. With the recreation area’s increased size came increased opportunities for trail users. Within the original state park are the short Lagoon Trail and Chickadee Nature Trail, both under a mile in length. Connecting the Saginaw Bay Visitor Center with Tobico Marsh is the Frank N. Andersen Trail, a 1.25-mile long paved rail-trail. Within Tobico Marsh are a pair of loops, the 2.7-mile Big Loop Trail and the 0.45 mile Little Loop Trail. From the Chickadee Nature Trail, a paved path heads south to connect the park with the Bay County Riverwalk Rail-Trail. This rail-trail is a 17.5-mile network of walkways and pathways that winds through downtown Bay City, skirts the Saginaw River at Veteran's Memorial Park and passes through woodlands and marshes to agricultural and residential areas of Portsmouth, Hampton and Bangor Townships. By far the most popular trails in the park are the Andersen Trail and Tobico Marsh which are often combined to form a nearly 5-mile outing from the Saginaw Bay Visitor Center that are open to hikers, mountain bikers and, to a lesser degree, Nordic skiers in the winter. Bay City State Park's campground features 193 modern sites with 50-amp service in a lightly wooded area away from the bay. 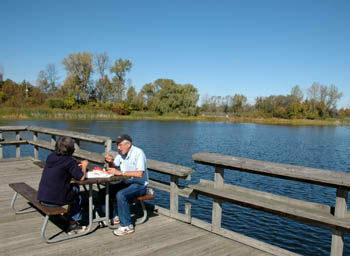 No sites have a view of the water, but the park's day-use area lies only a short walk away along a foot trail. Located north of the picnic area and reached by a boardwalk is the park's reconstructed beach and designated swimming area. A bathhouse-store is at the site of the old beach and is surrounded by a picnic area, shelters and parking for 1,500 cars. 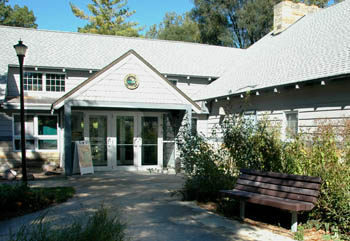 The Saginaw Bay Visitor Center (517-667-0717) was dedicated in 1995 as the newest state park interpretive center. Formerly known as the Jennison Nature Center, the exhibit hall is a result of a million dollar renovation that now explores how the Saginaw Bay was formed and the abundance of life found in a wetland. The facility features a 100-seat auditorium with a multi-image slide show, hands-on displays that help visitors to learn how to identify waterfowl and a glass-walled observation room to observe wildlife. The Saginaw Bay Visitor Center (989-667-0717) is open Tuesday through Saturday from 10 a.m. to 5 p.m. and noon to 5 p.m. Sunday. A vehicle entry fee is required to enter the state park. For more information on the trail call the Saginaw Bay Visitor Center (989-667-0717) or the Bay City State Park headquarters (989-684-3020). For a campsite or cabin reservation contact Michigan State Park Central Reservations (800-447-2757; www.midnrreservations.com).